Out for a nice walk, eating some grass and not yanking Lauren’s arm off! Bonus! I am in the “oh, my God! I am not going to have use of my arm for several weeks and I better get everything I ever imagined done before I have surgery”, which is really stupid. But I get a) compulsive and b) seem to have a little ADHD. I get going on one project, then see something else that needs to be done, drop what I am doing and never complete what I started. 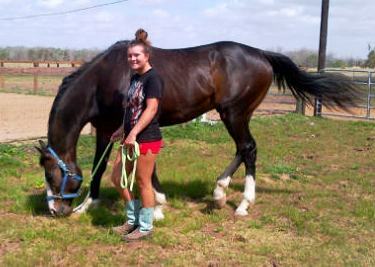 Jordyn spent the night after Leadline and we all worked on chores. We all enjoyed the nice weather. I had promised Jo a ride on Feather, but felt I better get on first. Lauren is still sidelined from her fall this week. I had not ridden Feather since last spring. I was pleasantly surprised to have such a nice, responsive horse under me. 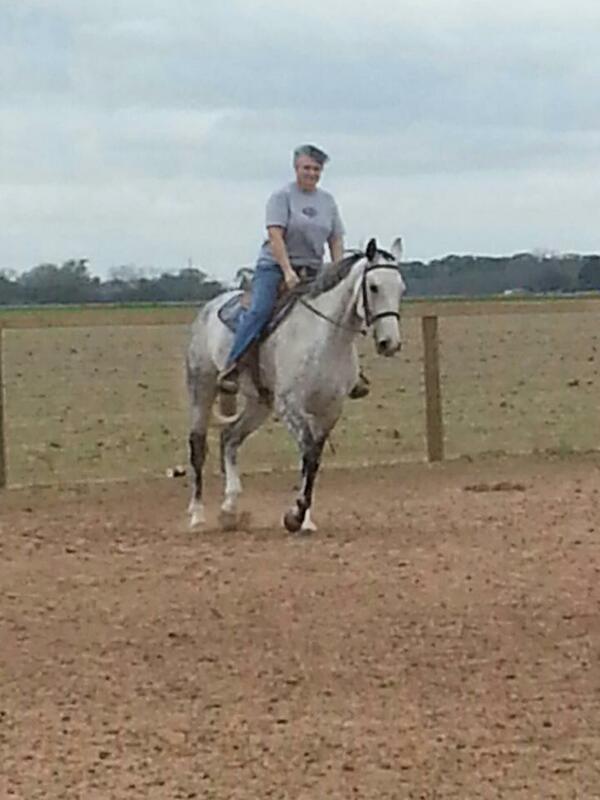 She trotted well and picked up her canter immediately when I asked. Well, no I don’t but we will have a pony ready for her if she is ready to ride. Lauren went off to see Blake and Jo and I finished feeding and the night-time chores. I was rushing off to take Jordyn to meet her folks. I did not completely latch Bruno’s stall gate (I know, I know, really stupid). I got back from taking Jordyn home to find Bruno cantering around the stall run. Kid was hidden back in the corner of Bruno’s stall-staying out-of-the-way of the big horse as he enjoyed freedom for the first time in months. I took my time getting him back in-actually I wasn’t sure how I was going to catch him without grave danger to myself. As I watched he bounded around the pen (I was thankful for the six-foot high walls) stopping to roll in the warm sand, first one side then the other. Not once as watched him, did he show any signs of lameness. Finally, he stopped to drink deeply from the water trough. I slipped a lead rope around his neck and he came quietly behind me into his stall. He was lathered with sweat and covered in sand. I was grateful this morning to find Bruno no worse for his evening romp. I figured it was a good time to try a walk again. At least, he would be tired. 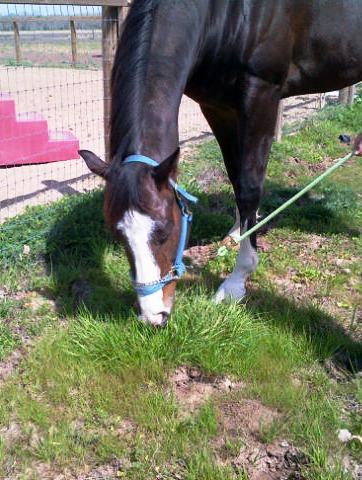 So, I took Kid and Lauren-Bruno and both boys got to eat some nice green grass. Bruno behaved like a gentleman the entire time. Guess we will start a daily outing so it all becomes more commonplace and less exciting. Happy Easter all! We will celebrate with mom, Ally, Kendyll, Jo, Lauren and I tomorrow. Amber and the kids will be here Monday.